Once the center of the literary universe, Paris is filled with former haunts of word slingers. On more than one trip to the city, I have found myself on a gin-soaked trail of F. Scott Fitzgerald and Ernest Hemingway in hot pursuit of a way of life that was wrapped in literary rapture, booze and romance. 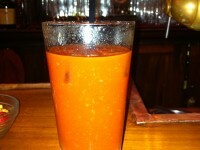 An early afternoon Bloody Mary at the expat hangout, Harry’s New York Bar, on Rue Daunou. A midday glass of wine at Cafe de Flore or Les Deux Magots in Saint Germaine. A serendipity cocktail at the Hemingway Bar at the Ritz. You see, many writers were also prolific drinkers, so the path almost always leads to a bar. At 11:30 p.m. on my final night in Paris, I felt that familiar tug. “One more drink with an old friend,” said a whisper. As I pass through the doors, it has been more than a century since Wilde’s death. Fifteen years after a major remodel where the building would sheds its skin and be reborn into the luxury establishment, L’Hôtel. 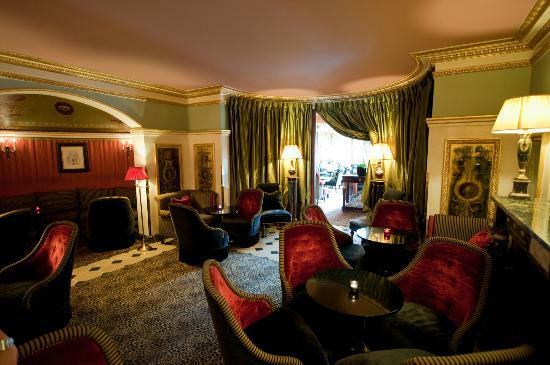 Swathed in fine silk curtains and punctuated with marble columns and plush, velvet tufted chairs, the space has Paris panache. On this particular evening the bar, simply named Le Bar, is quiet. Two businessmen are settling their tab for the night. There is a couple in the corner canoodling who don’t seem to notice we are there. I collapse into the stuffed chair and let it envelop me. I order a Saint Germain Sour (Whisky Maker’s Mark, Saint Germain, Citron Vert), which I take slow deliberate slips from, so I can feel the whiskey run through my veins. I want to take in every moment, because I know it will be over all too soon. It is crazy; I never would have guessed writers were big drinkers. 😉 As always, thanks for reading and commenting, Alastair!